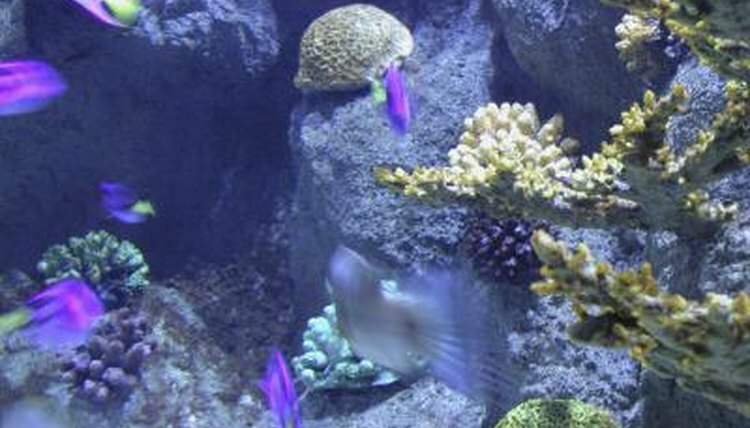 Fish and other organisms in a reef aquarium, such as plants, corals and snails, require oxygen for survival. Many factors, including temperature and tank lighting, affect the oxygen level in a reef aquarium. Maintaining the proper oxygen level ensures your inhabitants do not suffocate and eventually die. Since reef aquariums generally require warmer temperatures, the fish and other organisms have a high basal metabolism, which increases their need for oxygen. When the oxygen level is compromised, good bacteria suffer and the reef aquarium becomes a breeding ground for harmful pathogens, such as heterotrophic bacteria and parasites, according to the Fish Channel website. To maintain a healthy environment, the dissolved oxygen level should remain between 5.5 and 8 mg/l for optimal fish and plant survival. Without oxygen in the tank, fish begin to act like humans who suffer from hypoxia, or a lack of oxygen. The fish often become listless or lack energy. They many swim more slowly than usual or look sick. You may find your fish hanging out at the top of the tank, where the oxygen content is highest. If parasites or pathogens take over, your fish may suffer. Signs of disease in fish include changes in skin color, either red or white, and lesions on the skin. Plants and corals may also turn unusual colors and begin to die. Contact your local reef specialists if these signs occur. Water in a reef aquarium absorbs oxygen from the surface air. Adding a pump and filter to your tank and aerating the tank helps move the water around and circulates the air in the tank. Without aeration and circulation, the water on the bottom of the tank may be depleted of oxygen. Although any filter-and-pump combination approved for reef tanks is acceptable to maintain natural flora, or good bacteria, and remove harmful particles, the most popular type is the corner filter, according to the Fish Channel website. Since water needs ventilation and air, make sure the top on your tank is not too tight or obstructing the air from entering your tank. Also, do not overstock your reef tank. Of course the number of fish and plants you can keep depends on the size of your tank; four to five fish in a 55-gallon tank is generally a good rule of thumb. Keep healthy plants in your tank, with adequate lighting, so photosynthesis occurs and oxygen is released into the water. Check your filter at least once a week and make sure it is working properly. What Are the Dangers of Stagnant Aquarium Water?